Maghreb Blog: A New Government in Tunisia: Reinventing the "Old Regime"? A New Government in Tunisia: Reinventing the "Old Regime"? Tunisia announces its new "national unity" government amid continuing disorder and insecurity. Over the weekend, the military clashed with Former president Ben 'Ali's security forces, notably around the Carthage presidential palace. The role of the current government headed by interim president Fouad Mebezaa and prime minister Mohammed Ghannouchi, former "Mr. Oui Oui" in Ben `Ali's state, is to oversee the upcoming elections in 60 days. Mebezaa, the former speaker of the parliament, is a 70 year-old technocrat, who served in different functions under both Bourguiba and Ben `Ali. 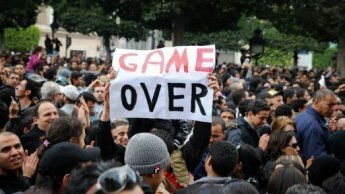 As Tunisia maneuvers through its "Jasmine Revolution," questions still remain as to the future trajectory of the country. Can this government provide a peaceful transition towards democratic governance, and a truly all inclusive political system? Already many complain about Ben `Ali's Constitutional Democratic Rally's control of the government, with notable cosmetic changes. Minor cabinet portfolios were bestowed upon the opposition. Ahmed Najib Chebbi of the Democratic Progressive Party is entrusted with the Ministry of Regional and Local Development, Moustapah ben Ja'afar of the Democratic Forum for Work and Freedom as Minister of Health, and Ahmed Ibrahim of the Ettajdid Movement is at the helm of the Ministry of the Ministry of Higher Education. However, the key ministries of the Interior, Defense and Foreign Affairs are still held by former Ben `Ali ministers. Moreover, Prime Minister Ghannouchi admitted on French TV that he still maintains phone contact with the "deposed" president. So far, it seems that the pillars of the regime are not completely destroyed and there is a clear attempt to reproduce the ancien régime. Some have already leveled charges against external powers (Libya, France and even Israel) that seek to abort this social revolt. The role of the military is also still unclear as it attempts to pacify the Tunisian street. Its future position behind the scenes is key to a true democratic shift in Tunisia and to maintain a clear distinction between civilian and military lines of authority. Let's not forget the sudanese uprising that took down Ja'afar Numeiri, to later degenerate into a military dictatorship. The "Jasmine Revolution" has sparked a lot of debate as to its nature and factors behind it. Some dubbed it a "twitter" or "wikileaks" revolution, but the truth is that it was a spontaneous popular uprising against a thuggish police state that has long abused and violated its own people. The social uprising has triggered hopes of an "Arab spring" of democracy. It has also engendered fear in many Arab capitals, which have so far maintained a deafening silence in reaction to it. Except for Libyan leader Mu'amar Qaddafi, who condemned the Tunisians for toppling Ben `Ali, lamenting wikileaks, facebook and twitter for fomenting the uprising. There is still a long road towards democratic transition in Tunisia. History has shown that the early days of any revolution are key in determining the future path of the political system. So far, the new government looks more as reconciliatory attempt from the old, still existing regime to perpetuate itself and reinvent it in a new façade calling for democratic change. The Tunisian people behind the remarkable revolution ought to stand steadfast and stop nothing short of a complete removal of all relics of Ben `Ali's regime.